In 2015, over 2 billion smart payment cards were distributed. That’s up 34% over 2014. American’s are demanding “contact less” cards featuring the so-called “tap and go” technology. What is a smart card? Similar to Apple Pay or Google Wallet (which use your smart phone), a smart card is a single card that contains all of your different credit cards, frequent flyer mileage accounts, in-store cards and member loyalty cards all tidied up into one dynamic card. 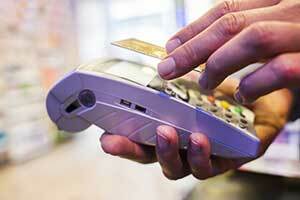 Smart credit cards primarily offer convenience while maintaining security. Instead of carrying a dozen cards (including gift and rewards cards), all your payment options are in one dynamic card. You may be wondering how all this works. It works like this: A card similar to the magnetic stripe cards you currently carry is embedded with a Bluetooth connection, that it uses to act as a variety of cards. At least three companies have entered the space: Swyp, Stratos and Plastc. You’ll have to wait to get them, though. Plastc, Swyp and Stratos are currently taking pre-orders. The selling point on smart credit cards is that they offer convenience. Instead of crowding your wallet with many cards, one digital card represents them all. Stratos, Swyp and Plastc achieve this in an unexpected way. When you receive one of these cards, it comes with a magstripe reader that looks a lot like the Square or PayPal card readers. Once you’ve confirmed your identity, you’ll be able to add your “old school” cards to the smart card’s app by swiping them through the card reader. Using Bluetooth, the app loads the information onto your smart credit card. How can one magnetic stripe act as many different cards? Like this: When you select the card you want to use, an induction coil embedded within the card sends a signal that re-programs the magnetic strip. They’re just like any other credit card, so you should be able to use them everywhere. Most of the credit cards in your wallet are actually equipped with two magnetic stripes, called “Track 1” and “Track 2.” You can’t see them. They are usually masked under what looks like a single stripe. Track 1 is primarily used for your name, while Track 2 is used for your credit card number. If a credit card contains both tracks, then your card will be accepted universally. But, if the card only contains one track (Track 2), then some credit card terminals might not be able to read it. Smart cards can also be used with ATMs. There are many new built-in security features that will protect you if you lose the card. The biggest feature is that your Smartphone must be present for your smart card to connect with via blue tooth. Tapping the card on a hard surface prompts you to enter a four-digit code into your phone for the card to work. Are Gift Cards Subject To PCI Compliance?